Do you remember the much talked about Tesco shopping wall which was put up at one of the railway stations in South Korea couple of years back? It was a touch display wall, where commuters could actually buy the groceries while waiting for their train and the items would be delivered at home. Now, India too can boast of having such a virtual shopping wall – Homeshop18, one of the popular online stores in India, today announced the launch of virtual shopping wall called ‘Scan N Shop’. This Virtual Wall offers premium merchandise to consumers at Terminal 3 (T3) domestic side of New Delhi’s-IGI Airport (IGIA). 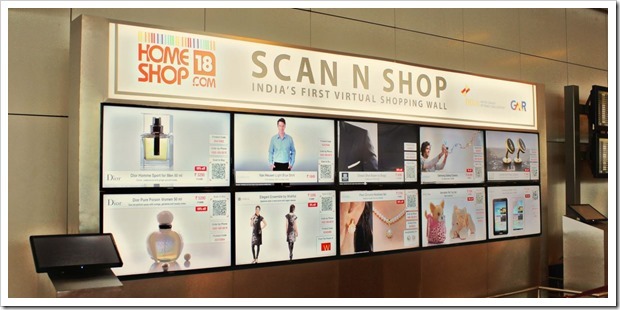 HomeShop18’s virtual wall will offer a unique and innovative shopping experience to over 45000 passengers that depart daily from T3 at IGI Airport. Travelers can buy range of products including consumer electronics, mobiles, tablets, clothing, accessories, fashion jewellery, perfumes, etc. If travelers need to make a purchase using the virtual wall, they can order by scanning the QR code displayed against each item or over the phone at the call centre. The products purchased from the virtual wall currently have Cash-on-Delivery facility, however, in future the main aim is to provide mobile payment facility to buyers. Being the first, hordes of travelers will throng the virtual wall atleast initially due to curiosity factor. What needs to be looked at is whether, actual purchases will be made or not. From the looks of it, virtual wall is actually just a display of products on large screen and customers will need smartphones with QR code facility to actually scan and make purchase, which is kind of equivalent to visiting homeshop18 on your mobile and purchasing. While virtual walls can really work out well for grocery store products, I am not too sure how well it will work with products like consumer electronics, mobiles, tablets, clothing etc. These are generally the products which an individual wants to buy at leisure and that too after doing bit of research. Having said that, Homeshop18 has a first mover advantage and if not anything, they will definitely get lot of eyeballs and brand recollection, that may indirectly bring them more footfalls and sales on their website. Also, travelers who are not too net-savvy may find making purchases using virtual wall easier. Would love to hear your thoughts on India’s first Homeshop18 virtual shopping wall! This isn’t virtual shopping mall. Its just a display board with payment interface. What’s the point is using wrong term?